Valensa International has conducted extensive research on a multi-patented formulation, available B2B, that has been clinically studied to maximize joint comfort. Unlike individual ingredients, this is a three-part formulation, working in synergy to deliver fast-acting and sustained joint relief. The proprietary formulation of astaxanthin, lower molecular weight hyaluronic acid and krill oil phospholipids will help your brand differentiate from commodity joint products, which do nothing to relieve the aches associated with oxidative stress. Fast-acting, once per day, sustained joint support, available to our B2B partners. Eighteen patents covering astaxanthin, krill phospholipids and a non-animal derived, proprietary hyaluronic acid from Valensa. 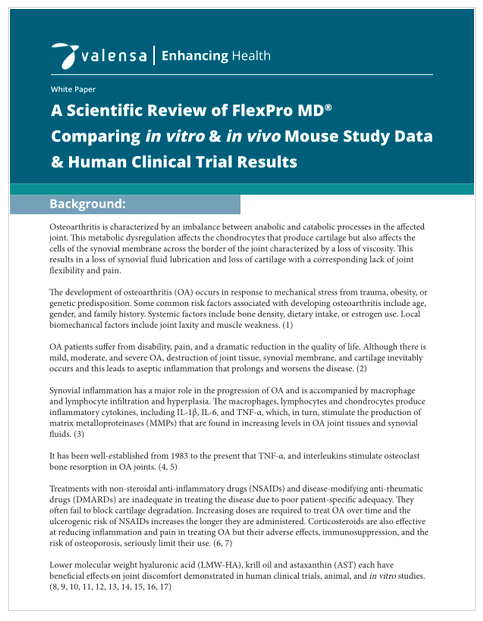 Double-blind, placebo-controlled clinical study and published mechanism study, 3x more effective than glucosamine-chondroitin.